We know that the cost and add-ons of a package to swim with dolphins in Cancun are your main concerns. However, we are also aware that to access these once-in-a-lifetime adventures, you don’t necessarily need to own or spend a fortune. Buying an online package to swim with dolphins can cost from USD$84.15 PP in Xel-Há or Xcaret parks-. It is important to keep in mind that, in order to know how much you’re going to spend, you must first have in mind how many people are coming with you. This way, you'll be able to choose what kind of interaction you want to do. How many people come with you? Nature Connection: Sail in a translucent kayak, dive and swim freely with dolphins and you will understand the impact that the human being produce in their natural environment. Delphinus Trek: Take a submarine trek with dolphins without the need of a diving suit, with a safe helmet that will allow you to live this close encounter to the fullest. Trainer for a day: With this swim with dolphins you can learn more about their anatomy, diet, behavior and medical care. You will learn through 14 different activities such as signals and caresses. The One: If you want to enjoy a personalized swim with dolphins, this interaction is for you. You can touch, kiss and hug the dolphin, as well as walk with him, make a foot push and 20 different unique activities. Couples Dreams: Live the experience of swimming with dolphins as a couple, enjoy one hour of a unique experience. Supreme: Enjoy a swim with dolphins exclusive for 4 people in Riviera Maya or Cancun. You can do up to 17 activities such as kissing, hugs, foot push, jumping and dancing. Interax: This swim with dolphins in the natural habitats of Xel-Ha and Xcaret make possible a unique experience of contact with one of the smartest animals in the ocean. 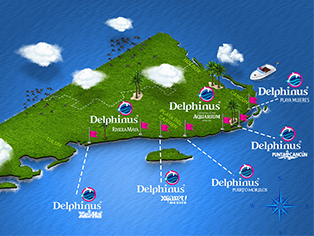 Dolphin Ride: This swim with dolphins is the perfect balance between economic and complete. If you wanted an additional activity, the Ride is the option, since you will take a walk along with the dolphin at high speed. Splash: This the perfect swim for you and your friends. It includes free transportation from some hotels, to the different habitats where this swim is available. Family Dreams: Swim freely with the dolphins, greet them, hug them, play with them and receive a dolphin kiss! Primax: This swim with dolphins is exclusive for 6 people and offers everything you would expect, 16 different activities like kisses, hugs, foot push, jumps, dancing and many others. Where can you swim with dolphins? There are totally natural habitats in this spot of the Mexican Caribbean, where interactions are better, since it is possible to swim with dolphins in a natural environment. So, don’t think about it any longer. Come and immerse yourself in an experience that you will always remember; experience swimming with dolphins in Cancun and gather unique moments with your family and friends.